Starring: Philip Seymour Hoffman, Ethan Hawke, Albert Finney, Marisa Tomei, Rosemary Harris, Bryan F. O’Byrne, Amy Ryan, Michael Shannon, Aleksa Palladino, Leonardo Cimino. Sidney Lumet is a director that’s no stranger to crafting intense pieces of work. In fact, he’s a master at it. Just look at a few from his highly impressive filmography like “12 Angry Men“, “Fail-Safe“, “Network” or “Serpico“. He’s also no stranger to a heist movie, having made one of the sub-genre’s best in “Dog Day Afternoon“. 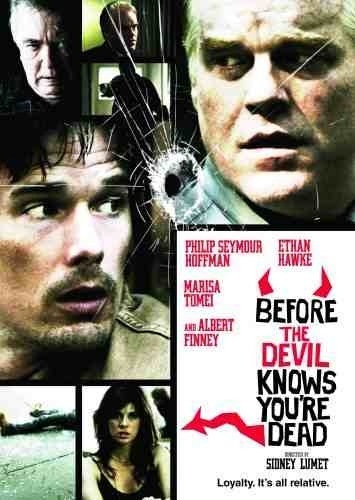 In “Before The Devil Knows You’re Dead” – his last film before his death – Lumet returns to that sub-genre and, once again, delivers with aplomb. Hank (Ethan Hawke) and Andy (Philip Seymour Hoffman) are two brothers whose financial woes are having a direct effect on their lives. In order to solve their problems, Andy hatches a plan to rob a jewellery store. He calls it a “mom and pop” operation and it’s quite literally that: the store is owned by the brothers’ parents. If all goes down as it’s supposed to, then nobody will get hurt. Like so many crimes of this nature though, things can and do go wrong, dragging everyone down with a devastating turn of events. Lumet builds his film slowly and assuredly, revealing the characters’ motivations bit by bit before peeling away the layers of their downfall. To do this, he cleverly plays with timeframes; changing back, forward and during the robbery itself. The focus is on the two brothers, as well as their emotionally stilted father (Albert Finney). Of course, this type of narrative device is nothing new. We have seen it used many times before but Lumet’s skill is in keeping it fresh and gripping. In support of his deft handling of the material, the actors deliver outstanding performances across the board; Tomei nails the ditzy wife routine; Hawke is marvellously high strung and weasel-like; Finney lends his usual reliability and there’s a small but welcome role for a threatening Michael Shannon. Unsurprisingly though, it’s Hoffman’s movie. He has a real presence here shifting from secretive to calculated then deadly with absolute ease. It may be unfair to single out one particular actor but this is another example of Hoffman’s incredible ability to completely inhabit a character. His downfall in particular, is of powerful and tragic Shakespearean proportions and he completely captures the intensity of a deeply immoral man. Sidney Lumet was in his 80’s when he directed this, yet it shows a vibrancy that could easily be associated with a much younger director. With a canon of top-quality films behind him, this is as good and as riveting as anything he has done. Sadly it was his last but what a film to go out on. This entry was posted on October 12, 2012 at 10:02 am and is filed under Crime, Drama, thriller with tags 2007. You can follow any responses to this entry through the RSS 2.0 feed. You can leave a response, or trackback from your own site. Agree, this is an amazing film, which I feel (although I might be incorrect) not many people have seen. Great performances by Hawke and Hoffman. Absolutely Nostra. I was completely gripped by this and the performances are superb. It’s a real shame we won’t have the pleasure of Lumet’s talents anymore. He was truly a magnificent director. Great review! Not seen this but it sounds great. That’s not a bad filmography of Lumet’s really! Cheers Chris. This is certainly worth a look. And yes! It’s quite a list that Lumet has to his name. He was one of the most consistent directors around. I need to see this one. Sidney Lumet is one of my favorite directors and it sounds great. Nice review. If your a fan of Lumet you should really enjoy this one man. I’m also a big fan and I absolutely loved this. The performances are outstanding as well. This is one that I’ve never caught up with. In fact, I remember seeing the poser image you posted but otherwise I’m unfamiliar with it. What a spectacular cast! I’m gonna have to give it a look. Fine review Mark. Cheers bro. You’d be treating yourself with this one. It’s just a fantastic crime yarn that has everyone playing at the top of their game. Seek it out at once, I’d say you won’t be disappointed. Great write up of a great film Mark. Really enjoyed this movie, and I should really try and get it watched again soon. Cheers bro. Fantastic film and one that I’m glad I caught up with again recently. Loved every minute of it. Such an awesome film, I’ve made a ton of people watch this movie because it’s so under appreciated. The acting was phenomenal. Glad to hear you’re in agreement Ryan. It’s a film that definitely more people should see. I couldn’t get over how good the performances were everyone stepped up to mark here and it’s a real high-note that Lumet went out on. In 2005 Lumet won his only Oscar, the Lifetime Achievement Award. Two years later at 82, he helms this minor masterpiece. I don’t believe its ever been done before. Actors seem to always save their best for Lumet. As proof I submit “Dog Day Afternoon” and the “Verdict”. Despite Oscar caliber performances at every turn, “the Devil” was totally snubbed by the Academy. Albert Finney deserves special recognition. He centers this film with perfect calm in the midst of an emotional family storm straight out of Eugene O’Neill. This movie breaks the crime drama mold and is one of the best ever! I can’t understand why this was snubbed at the Oscars Ray. Like you say, everyone here delivered some sterling work and it definitely ranks as one the crime genre’s great ones. Great review, I need to get round to watching this one. Cheers Vinnie. It’s an excellent film and well worth checking out. I really enjoyed this… Some top performances and Lumet showed he hadn’t lost his mojo! Absolutely Dan. Imagine being in your 80’s and still able to make something as special as this? Thanks for stopping by man. Good review Mark. It’s one of those flicks that’s almost too dark to be enjoyed, but features so many great performances that it’s too hard to not see. It’s also a great swan song for Mr. Lumet. Thanks Dan. It’s a great swan song for Lumet. I can understand it being a big too dark for some but personally I was swept up in it. Totally gripping. Great review Mark. Wow the cast in this one is tremendous. 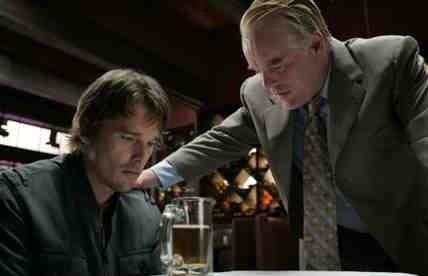 I’ve always liked Albert Finney, no matter how small his role is he’s always memorable. I’ll be checking this one out! Thanks Ruth. You’d be doing yourself a favour with this one. An absolutely riveting film where all the actors are terrific. Crime yarns don’t get much better. Well I’m sold! 🙂 The title is quite provocative as well. This is a great movie, though I doubt I’ll ever watch it a second time because it was so disturbing. 🙂 Terrific review! I am loving the way you described the character development in the film. Thank you. I found the character development to be the most interesting thing about it and each actor was really on top of their game. A fantastic film, Mark. You describe Hawke’s character perfectly: “high strung and weasel-like”. Also I agree with your assessment that “it shows a vibrancy that could easily be associated with a much younger director”. The acting is fantastic and the film is just a rollercoaster of emotions. Everything that can go wrong, does go wrong. Thanks Fernando. This certainly packs a bit of a punch and once it starts up, there’s no letting go. Glad to hear you enjoyed it also. excellent write up of an excellent movie! This film passed me by for a long time. But I recently found it and enjoyed it greatly!! Great review. Nice one Scott. It is quite surprising how few people have actually seen this but always glad to hear of other fans. Good to hear you enjoyed it. I wasn’t blown away by this when it came out but I feel like I need to revisit it, even more so after reading this. I’ve wanted to go back and watch all of Lumet’s. The first time I seen this, I was completely hooked Andy. On another viewing it worked just as well and like yourself, I really wan’t to revisit a lot of Lumet’s stuff myself. Somehow its easy to forget, just how much consistently good stuff he made. He’s certainly one the finest ever of American filmmakers. I haven’t read that Andy but I always hear good things. I must give that a go someday. Cheers man. This was one of my absolute favorite films of 2007. It’s written and acted to perfection. This was the last time I saw Ethan Hawke in a film until this year with Sinister. A surprisingly good horror flick. I couldn’t agree more Mark. It’s an absolutely superb crime flick and one that’s hard to fault. Lumet really did go out on a high note with this one. This might also be my favourite Ethan Hawke performance. I thought he was outstanding but just pipped by Hoffman, who’s one of my personal favourites. I’ve not seen Sinister yet but it has caught my eye. I’ll get around to that soon hopefully. Thanks Mark.